From The New Zealand Garden Journal (Journal of the Royal New Zealand Institute of Horticulture), Vol. 1, No. 1, March 1996, pp. 12-17. One of the activities of the RNZIH has been to assemble a list of New Zealand Plant Collections, which collates information on people and institutions who hold collections of particular groups of plants. Based on the scheme run by the English National Council for the Conservation of Plants and Gardens, it is intended to ensure that garden plants and threatened New Zealand plants are not lost but retained in cultivation for future use. 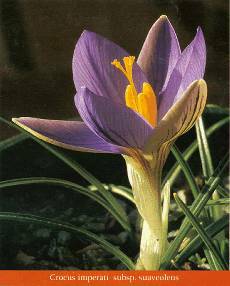 My personal interest in crocus goes back nearly fifty years, when I bought a range of species from Ralph Cusack, then well known as a specialist in bulbs. I was living in rather comfortless digs, and decided that crocus in pots could improve my surroundings. In due course they all flowered in the window of my bed-sit. The range of bulb coats, flower seasons, flower structures and colours revealed by those pots was fascinating and I was hooked! My literary mentor was E. A. Bowles, for his book "Crocus and Colchicum" and the chapters on crocus in "My Garden in Spring", the first volume of his trilogy, stirred even greater enthusiasm. Bowles was capable of inspiring as well as instructing, and although his style reads somewhat flowery today, he stimulated as many people then as Christopher Lloyd does today. It was many years before I really got to grips with crocus, although my interest in them never abated. Shortly after I came to New Zealand in 1956 I was stimulated by Jean Foweraker, and her garden at Cashmere on the hills above Christchurch was a plantsman's paradise. In particular, she had crocus species naturalised throughout the garden. When the Canterbury  now the New Zealand Alpine Garden Society  was founded in 1960, Jean was a regular exhibitor with her "basket of cut flowers", rarely without its complement of crocus species. Her monthly lists of "Plants in Flower" in the Society's Bulletin further stimulated members with the value of crocus. Mary Evans, another founder member of the Society, was another of those infected by Jean Foweraker, and she later became totally absorbed by crocus. When I retired in 1982, my wife and I decided to revert to my old loves  nursery work and alpines  and we established Kereru Nursery as a hobby occupation. One of our first purchases was a wide range of crocus species, imported from Potterton and Martin in England. We continued importing them in quantity for several years, and this was the foundation of our stock of crocuses at the nursery. More rarities originated from the superb seed lists of Jim and Jenny Archibald, particularly the newly-discovered species of crocus from Turkey. Our first offerings of crocus at the nursery were six autumn flowering species in 1986, and the numbers offered have continued to increase year by year until, in our final catalogue we listed over 70 different species and varieties. Obviously, we have continued the good work of spreading "Crocus fever". Our numbers were also increased in a further, sad, way. Mary Evans knew that she was dying, and before her death in 1991 I made arrangements to transfer her crocus collection to us. 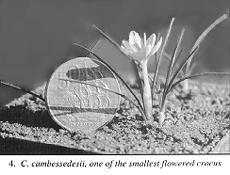 She had been collecting for many years, had world-wide contacts with crocus specialists, and had collected in the field in Greece and Crete in 1973 and 1978  in fact one of the finest Crocus sieberi ssp. sieberi forms we hold (Photo 2) was collected in Crete by Mary. Our agreement with Mary, on accepting her collection and amalgamating it with our own, was that we would maintain, expand, and document our joint collection as part of the New Zealand Plant Collections List. This article is the first public contribution to that end. My first task was to verify Mary's collection  unfortunately many of the labels had become fragile and broken, with critical parts of the name missing. Mary's documentation was excellent, so with its aid, and the keys and descriptions in Brian Mathew's monograph, "The Crocus" (Batsford, 1980), I have almost completed this task. Although there are still about 80 batches awaiting final identification, most appear to be only duplicates. I do not think there are any more significant additions to be made to the total list of species and sub-species held. The other generous contribution I must acknowledge here is the gift by Mrs Betty Laurenson of the beautiful plates from George Maw's magnificent "A Monograph of the genus Crocus" (Dulau, 1886). Although Brian Mathew's book is invaluable, the plates, being produced by techniques which involve screening and multicolour printing, are less clear than Maw's engraved plates where fine detail is concerned. The detail of stigma and stamens, corm coats, and leaf cross-sections in particular  all of which are essential in identification  is better in Maw's plates than Mathew's, even though in some cases they were made from the same drawings. Nowhere is the value of "Maw" shown more clearly than in the detail of corm coats. Almost all crocus species have characteristic coats, and some of them  C. laevigatus for example  are so distinct that they cannot be mistaken for anything else. In others, although different, they are less clearly differentiated, particularly when you haven't "Got your eye in", Brian Mathew's word pictures are very accurate and precise, but it does take time to grasp his precision of words. To him, the differences between "membranous" and "papery", or "coarsely reticulated" and "very coarsely reticulated" are quite clear; he has handled thousands of bulbs. You have to learn the precision of his language. But whilst you are doing so, one picture  with the clarity of Maw  is worth a thousand words. Maw's book is a very expensive rarity, so Betty Laurenson's gift was of real value, both in itself, as well as for verifying identifications. Some of the rare species held by Mary Evans were present only as single specimens, but in almost all cases, corm numbers have been bulked markedly since 1991. Whilst crocus sometimes may be bulbs of dry and barren landscapes, they do respond to loving kindness, and in particular careful use of fertiliser gives them a real zest for life, multiplying much more freely. Today, the collection is in good heart, accurate, and well documented. Mary Evans would be pleased. So what is it that stirs the collector to cosset his love? As Shakespeare said, "Custom cannot cloy her infinite variety" even though he was writing of a different sort of love! It is certainly not a case of "A crocus is a crocus is a crocus" for their variety is  well, not quite infinite, but certainly very wide. The crocus genus is widely distributed in the northern hemisphere, extending from 10 degrees west, in Portugal and North Africa, to 55 degrees east, with odd species scattered as far east as the Ala Tau Mountains in Western China. The majority of species occur in the Balkans and particularly Turkey, where many new species have been collected since the 1950s. Northwards they extend as far as Krakow in S. Poland, and southwards into southern Jordan and Iran. Although this distribution area is so wide, its climate is largely a dry summer, winter rainfall regime, which makes crocus so suitable for cultivation in eastern and central-southern New Zealand. Nevertheless, not all crocus species appreciate summer dry conditions, particularly those from open woodland habitats. Crocus banaticus, C. scharojanii, the unpronounceable C. cvijicii, and C. nudiflorus are all examples of plants which should not be dried out in summer. Perhaps the most obvious of the "infinite variations" is the broad division into spring and autumn flowering species. In fact the season extends from early February until late September, with the bulk of species blooming in either March and April, or June till August. A few species such as C. imperati and C. laevigatus have quite prolonged seasons over the winter months if the weather is kind. The earliest of all is C. scharojanii, the only autumn flowering species with yellow flowers, followed in late February by C. vallicola. This creamy-white species, with yellow spots in the throat and purple veins to the petals, has distinct petal tips. They narrow abruptly and then extend into a sharp point  the only crocus which does so. In March there is a long succession of species in flower including C. kotschyanus, C. banaticus, C. cancellatus, C. hadriaticus, C. nudiflorus, and C. pulchellus and the closely related C. speciosus. In April C. medius, the beautiful pair, C. longiflorus and C. tournefortii, C. serotinus and its sub-species, and C. goulimyi are amongst many which can be relied on, whilst the yellow-throated, white flowered C. ochroleucus draws the season to a close, flowering through into May. Spring can start very early if the weather is mild. C. laevigatus occurs in a wide range of forms, collected from its various habitats in Greece, Crete and the Greek Islands. So flower colours and sizes vary widely and so do the flowering seasons, from May till August. C. imperati is much less variable, but its lavender-purple flowers with purple striped, biscuit-coloured external petals, is one of the joys of the winter months (Photo 2). True spring flowerers start with C. sieberi and its forms, C. corsicus, C. dalmaticus, the yellow flowered C. korolkowii and C. gargaricus, and many others. Crocus tommasinianus and its later-flowering forms, 'Whitewell Purple' and 'Ruby Giant', together with the multi-coloured varieties of C. chrysanthus, form the main body of flowering in many gardens. The season comes to a close with the late-flowering varieties of C. vernus, the mountain crocus of the European Alps. Although crocus do not commonly interbreed, some hybrids exist, and the September-blooming vernus variety, 'Harlem Gem', shows distinct biscuit colours in its external petals, which originate from the genes of C. tommasinianus. Flower colours are usually white, yellow, and various shades of purple. There is considerable variation in detail though, with white, yellow and purple throats, distinct white or yellow eyes, a multitude of different stripes on the interior and exterior of the flower, and different internal and external colours overall. All are important in identification. True blue is generally lacking, but a few recently discovered Turkish species, such as C. baytopiorum and C. abantensis are close to being china-blue. Unfortunately both are still uncommon in cultivation. The most brilliant blue, in my opinion, is C. biflorus ssp. pulchricolor, but not all forms are equally beautiful. 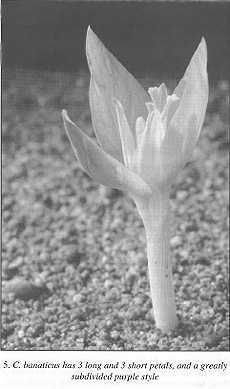 This variability is characteristic of crocus and occurs in most of their characters  size, colour (Photo 3), corm coat, and leaf width. It is important that identification does not depend upon a single specimen. The variation in flower size between species is considerable; some, such as cultivars of C. speciosus, are up to 10cm across, whilst the smallest, C. cambessedesii (Photo 4) and C. danfordiae, are only 20-25mm across. Stigma and stamens are markedly different in the various species and are most important for identification. C. banaticus not only has three long and three short petals  it is the only species with this character, and used to be called "C. iridiflorus" as a result  but also has a unique purple stigma (Photo 5). 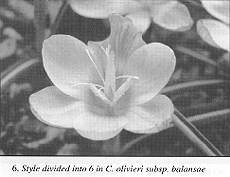 It is very finely dissected, the basically triple divided stigma of crocus overall being split into very many segments. Stigmas vary from being triple with frilled tips (C. sieberi and C. chrysanthus) 6-lobed (C. olivieri) (Photo 6), to finely dissected (C. banaticus and C. graveolens). Incidentally, C. graveolens is the only crocus with an unpleasant scent. Stigma colours vary from white through cream and yellow to bright orange and red, and the purple of C. banaticus. Several species have considerable decorative value due to the stigma colour. In C. medius and C. nudiflorus the contrast of rich purple petals and scarlet stigma is very striking, but that of the pure white petals and scarlet stigma in C. niveus and C. cartwrightianus albus have even greater punch. Stamens are usually yellow or white, but in a few species such as C. hyemalis, and C. biflorus ssp. melantherus (Photo 7) they are purplish black. The well-known spring crocus, C. chrysanthus, frequently has distinct black, backward-pointing "barbs" on the stamens (Photo 8). The colour of the filaments, on which the stamens are mounted, is either yellow or white, but occasionally, as in C. pestalozzae, there are characteristic black spots at their base. E. A. Bowles likened them to specks of dirt dropped into the throat of the flower. Corm coats are tremendously varied, all the way from coconut matting to egg-shells and tissue paper in appearance. A 10X magnification hand lens is an essential tool in diagnosis. Without it, the fine detail is much less obvious. If you "get your eye in" by examining very distinct species such as the coarse coated C. angustifolius (Photo 8) or C. cancellatus, and the papery C. ochroleucus (Photo 9), you can then progress to separating, say, C. longiflorus and C. medius, or C. imperati and C. dalmaticus, in which the differences are much less marked. All these species have fibrous coats, but with differences in their reticulate or parallel nature, and the fineness of the fibres. Others, like C. laevigatus, are quite unmistakable. It has a hard coat like an egg shell, which splits into triangular points at the base. Often, a group of species will have similar coat characters. 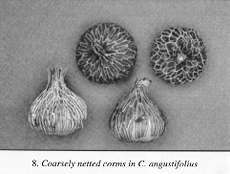 For example, C. chrysanthus, C. biflorus, C. pestalozzae, C. speciosus and C. pulchellus all have corm coats in which the coat at the base of the corm separates into rings. The papery coats of C. ochroleucus and C. kotschyanus can be very similar, but then distinction is possible on corm shape. Both are flattened, but C. kotschyanus is markedly irregular in shape. 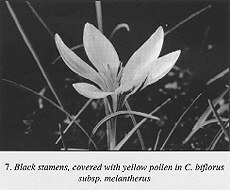 To many, this may be esoteric trivia, but I can assure readers that to the bulb nurseryman it is essential know how for his trade; there is ample scope for a photo-atlas of corm coats in crocus, and I am progressing towards it. Such is the incidental value of a crocus collection. 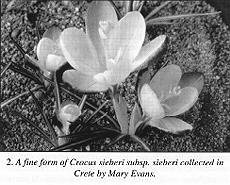 Leaves in crocus species vary in number, width, venation, and shape, and when added to the other elements of identification already discussed, can help to confirm or deny an identification. The widest leaf of all is C. vernus, which can be 8mm wide; many compete for the title of being the narrowest, and C. fleischeri, C. pestalozzae, and C. danfordiae, as examples, all have leaves narrower than 1mm. Leaves are usually two-faced, with a distinct upper and under surface. In all except C. scardicus and C. pellistericus the upper surface has a pale stripe down the centre. The underside has various grooves and veins, beautifully depicted in Maw's plates, often characteristic of a species. The only species without them are the various relatives of C. kotschyanus - vallicola, ochroleucus, scharojani and karduchorum. In these, the leaf is rather like an H girder on its side, so that upper and under surfaces are similar. Not all species have leaves which emerge with the flowers, and all the autumn-flowering species, except C. ochroleucus and C. serotinus and its sub-species, have naked flowers. Leaf length at flowering can be a feature of identification too. So it can be appreciated that to the crocus fiend, their very variety is a feature of interest as much as anything else, and when coupled with their garden value  particularly if your garden is small  they are very desirable plants. Cultivation is not difficult, and only a few are not good "doers". Some are slow to multiply vegetatively  the Cretan forms of C. sieberi, for example, multiply very slowly compared with those from Greece. Seed raising is quite straightforward, and in most species the ripe capsules appear above ground, looking like fat matchsticks, between November and January. 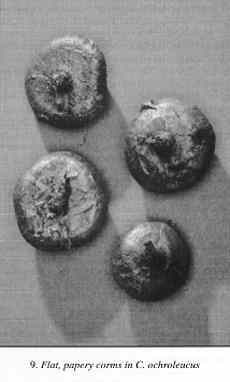 A few, such as C. caspius and C. hadriaticus, ripen their seeds just under the surface, and are often held in the un-opened seed capsule for some time. Seed should be collected and sown immediately, surfacing the pans with grit; flowering normally occurs in the third year. Generally, the needs of crocus are limited. A friable well-drained soil in a sunny spot, the occasional light dressing of tomato fertiliser, moisture during their growth period, and particular attention to the needs of woodland species mentioned earlier. In areas which are damp during the dormant season it may be necessary to provide overhead protection for species originating in dry arid regions. Otherwise  just enjoy! A list of taxa held in our collection is appended for interest. Those listed in brackets are taxa not held, but known to science. Items marked * have been introduced to science since Mathew's monograph was published in 1980. Charlie Challenger passed away September 2007. His obituary was published in the New Zealand Garden Journal (Journal of the RNZIH), Volume 10, Number 2, December 2007. pp. 24-25. The Crocus collection described in this article has now been transferred to Dr Melva Philipson of Nelson. 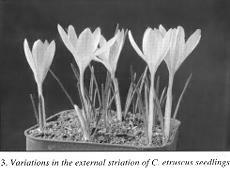 Crocus Pages  "the largest online resource for the genus Crocus"
Jacobsen, N.; van Scheepen, J.; and Ørgaard, M. 1997. The Crocus chrysanthus - biflorus cultivars. The New Plantsman, Vol. 4, Part 1: 6-38. Kerndorff, H. and Pasche, E. 1998. Miscellaneous Note 1: On the type locality of Crocus boissieri (Iridaceae). The New Plantsman, Vol. 5, Part 1: 11-14. Mathew, B. 1982. The Crocus. Batsford, London. Mathew, B. 1998. White forms of Crocus serotinus subsp. salzmannii. The New Plantsman, Vol. 5, Part 1: 10-11. Pasche, E. and Kerndorff, H. 1999. A new natural hybrid in the genus Crocus (Iridaceae). The New Plantsman, Vol. 6, Part 1: 43-46.